Galway County PPN (Public Participation Network) has been established to enable people and community groups in County Galway to have a say on issues that concern them. These Public Participation Networks (PPNs) are new structures for public engagement and participation in Local Government in each Local Authority area. Western Webs developed a multi lingual website to help promote the PPN . The site includes a range of features including events calendars, members directory, blog, galleries, knowledge bases and more. 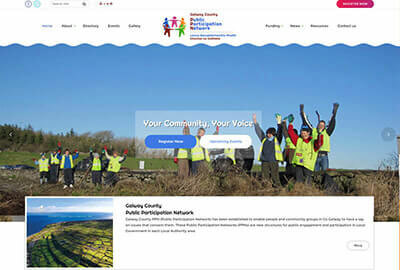 Visit Galway County PPN website.